In Between Destinations – Pireaus | Beat Like Kerouac – now with child! Seeking to placate our “Pireaus nerves” with some concerted sightseeing, today we rode a local bus into Athens in order to perform one of those pilgrimages that everyone should undertake, a visit to the Acropolis. Standing on an outcrop above the city center, the Acropolis is the home to one of the most recognizable ruins in the world, the Parthenon. Built by the Greeks before Jesus was a twinkle in Joseph’s eye (who are we kidding with the immaculate conception?) it was completed by a people without the benefit of machinery larger that a hammer and chisel, fossil fuels, or design systems like computers. And yet it combines complex architectural touches, like convex columns to counter the optical illusions common on such huge buildings resulting in them looking like the mad hatter’s house. To the Greeks, how something looks is very important. The sheer amount of stone required to build the buildings was staggering, how did they get it all up there? Slaves probably helped! An Evzone - They stand very still. 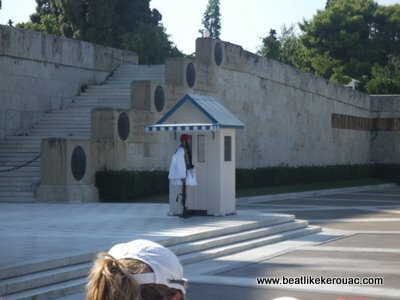 Aparently someone threw a firebomb at his little hut during the riots but the evzone never even blinked an eye!! In order for Lily to endure the long, crowded bus ride into Athens a little bribery was required. After Windsor Castle and the Vatican’s Swiss Guard, lollipops, episodes of “Sid the Science Kid” and her puppy-dog, come second to the possibility of seeing a new set of soldiers. For anyone familiar with Lily’s latest obsession, let’s just say we, as her parents, are very concerned that she may one day run off with a man in uniform. The latest set of soldiers over which to continue this obsession are the evzones or Greek guard. Their dramatic uniforms, complete with flouncy sleeves, red hats, “pompoms on their boots!” and slow, rhythmic stomping (I’d have to agree with Lily) might be the best changing of the guard yet. Afterward, we strolled through the Sunday flea market. Ashley passed about fifteen cheap handmade Greek sandal vendors before beating me into submission and obtaining a commitment for the purchase of a pair before we depart from the islands. Lunch in the market consisted of Mosaka (a lasagna of eggplant, cheese and meat), Greek salads and olives, washed down with cold Greek “Mythos” beers. Ashley discovered that when a house wine is ordered they don’t just bring you a glass, but a full half-liter. This made for a very interesting afternoon. In spite of being “in between” our destinations, we are glad for this small break in Pireaus. How could one come to Greece and not visit the Acropolis, wander through an available flea market and chat with some colorful local folk? And Ashley has yet to buy her sandals. One less pair of shoes in our luggage and 15 Euros more in the bank account. 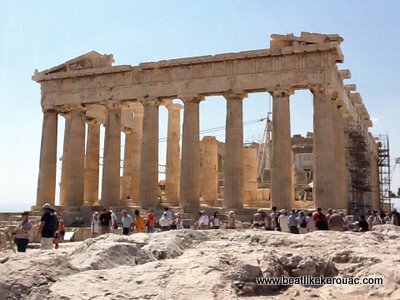 Gallery | This entry was posted in Greece, Travel and tagged Acropolis, Evsones, Greece, Greek islands, Parthenon, Pireaus, travel. Bookmark the permalink. We will have to give you a sample of the mousaka pizza at Paul’s Deli on your next trip into Williamsburg several decades from now. And fyi: the brilliantly costumed soldiers in the parade are using a march that I understand was recently banned by the British Ministry of Silly Walks because it tended to slightly lengthen the right leg after just 2 miles of total (albeit daily) marching. The BMSW did approve a variation that allows for a random or an even distribution of throwing each leg. They also found that this keeps down the cost of replacing footwear due to the eventual unevenness of the heel.